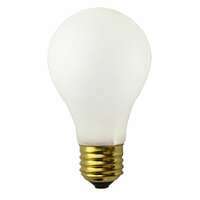 H&H incandescent bulbs are designed and engineered for durability, strength, and long burning life. Life-rated at 12,000 hours, this H&H bulb will outlast ordinary bulbs many times over. The rugged multi-support filaments stand up to the shock and vibration common to industrial applications. Unlike an aluminum base, a brass base won't freeze or corrode in the socket, even after thousands of hours of use. Comes with a 18 month free replacement warranty and the long burning life reduces maintenance and replacement costs.